After the fabrication of PCB, the quality inspection of the PCB should be carried out to determine whether the quality is compatible with design requirement or not. We can say that quality inspection is the important insurance of product quality and smooth implementation of subsequent procedures. 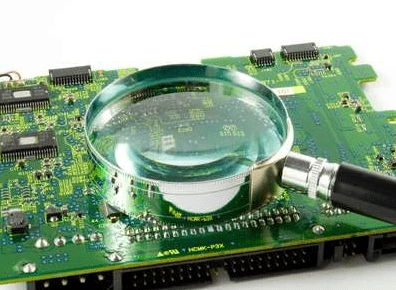 whatever be the type of PCBs, all have to go through similar quality inspection methods and tools. For low volume production runs, one effective form of inspection is where the person who performed the assembly simply look at the PCB with his/her own eyes. This doesn’t just mean a quick glance rather he/she must meticulously check each connection in a well-lit environment. Visual inspection is very simple to be carried out with the help of ruler, vernier caliper or magnifying glass. Board thickness, surface roughness, and warpage. Dimensions of appearance and assembly, especially assembly dimensions compatible with electric connectors and lead rail. Integrity and clearness of conductive patterns and existence of bridging short circuit, open circuit, burr or voids. Surface quality, the existence of pit, scratch or pin holes on printing traces or pad. Positions of pad vias and other vias. It should be inspected that whether vias are missed or inaccurately punched, whether via diameter is compatible with design requirement or not and whether there are nodules and voids. Pad plating quality and extent of firmness, roughness, brightness and void of bulge defect. Coating quality. Whether plating flux is even and firm and position correct and whether flux is even and its color meets concerning requirement. Character quality such as whether they’re firm, clear and clean with no scratch, penetration or disconnection. During this test, a multimeter is generally applied to inspect the connectivity of conductive patterns with a focus on metalized via of double-sided PCB and connectivity performance of multi-layer PCB. This kind of test aims to inspect insulating resistor on the same plane or between different planes in order to ensure the insulating performance of PCB. General technological inspection covers solderability and plating adhesion inspection. For solderability, the wetting performance of solder to conductive patterns is inspected. Then it can be inspected by qualified tips that are first sticked to plating plane to be inspected and then are pulled off quickly after even pressing. Next, plating plane should be inspected to ensure whether fall-off takes place or not. Furthermore, some inspections can be selected based on practical situations such as copper foil anti-falling intensity and metalized via anti-pulling intensity. Quality of metalized vias plays a significant role for double-sided PCBs and multi-layer PCBs. Lots of breakdown happening to the electric module or even the whole device lies in quality issues of metalized vias. Therefore, it’s quite necessary to pay more attention to the inspection of metalized vias. Metal plane of via wall should be complete, smooth and void of empty holes or nodules. Electrical performance inspection should be carried out in accordance with short circuit and open circuit of pad and metalized via plating plane, the resistance between via and leads. Resistance change rate of vias shouldn’t be over 5% to 10% after the environmental test. Mechanical intensity refers to adhesive intensity between metalized via and pad. Metallographic analysis test is responsible for inspection in terms of plating plane quality, thickness and uniformity of plating plane, and adhesive intensity between plating plane and copper foil. Metalized via inspection usually comes in a combination of visual inspection and mechanical inspection. Visual inspection is to observe the PCB by placing it under the light and complete and smooth via wall is capable of reflecting light evenly. However, via wall containing nodules or voids won’t be so bright. In case of multi-layer PCBs, if problems are observed in the process of subsequent unit module assembly testing, it’s difficult to position breakdowns quickly. Hence, inspection of their quality and reliability has to be very strict. Each parameter needs to be inspected by the application of professional equipment and methods.